Create a cool and comfortable spot to entertain guests under an attractive piece of outdoor decor that also provides quality sun protection with this 9’ Outdoor Patio Umbrella, by Villacera. The easy to use hand-crank opens and closes the umbrella in seconds to block sunlight so you can relax in the shade during hot summer days. The convenient auto tilt feature allows you to adjust the vertical tilt of the 9-foot canopy in 5 positions, providing UV protection where ever the sun is shining. In addition, this umbrella is constructed with 8 steel ribs and a durable aluminum pole for superior strength while enduring heat, wind, and rain! Simply crank the umbrella closed when not in use and use the built-in strap to secure it to the pole. SATISFACTION GUARANTEED- Villacera is committed to providing the consumer with the absolute best price and value on our entire line of products, which we ensure by applying a rigorous quality control process. NOTE: This is an exclusive product of Villacera and ONLY 9’ Outdoor Patio Umbrella, by Villacera are GUARANTEED to be genuine. CONVENIENT AND COLORFUL- The easy crank handle turns effortlessly to open and close the umbrella in seconds while the brightly colored 9-foot canopy provides ample shade. Continue to crank once the umbrella is fully open, to engage the auto tilt function. 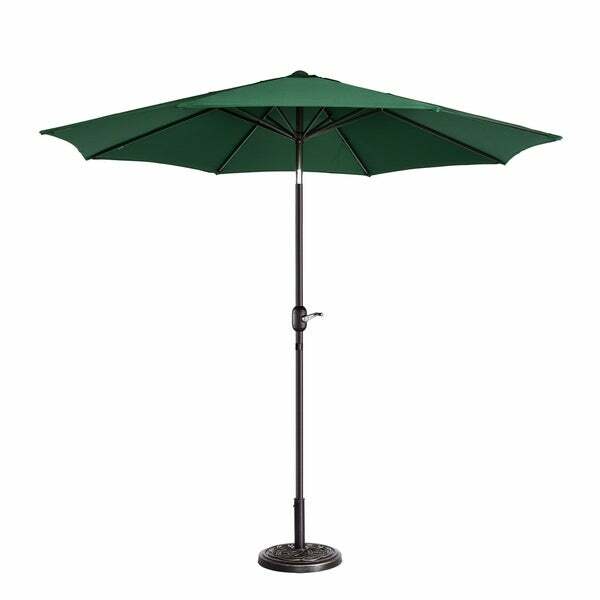 MULTIPLE USES- This umbrella provides shade in a garden, poolside, or can be placed next to a picnic table or outdoor table set. The large canopy will keep you and up to 4-6 guests cool and relaxed! SHELTER AND SHADE- The durable polyester fabric is made to withstand weather, so you can enjoy your backyard in hot summer sun or drizzling rain. Also, a vented canopy lets cool air flow freely and enhances stability- reducing damage caused by wind! LONG-LASTING- The 8 supporting steel ribs and pole provide trusted durability while entertaining your guests outdoors. This patio umbrella is crafted to maintain its quality and fashionably enhance your outdoor decor, season after season! Dimensions 108.0 In. X 108.0 In. X 94.5 In. yes i recommend this product. it is good. Very nice...great price. Steel sprockets should be nice when windy. "Does this have a base to hook up the umbrella?"